Hills Market host a lot of great food events, salmon and hog roasts, cheese tasting, dinners. This summer they are holding a series of crab boils. Sitting out on the patio on a hot summer evening eating crabs, you can almost forget you are in the landlubbery state of Ohio. 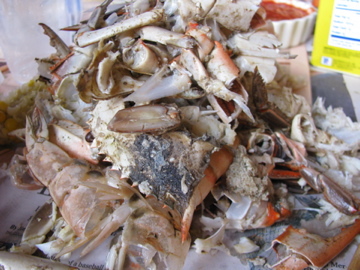 If you have never eaten crabs in the shell, the first thing you should know is that it is messy. The second is that you work hard for your food. We sat next to some disgruntled and whiny teenagers who weren’t impressed with the output to input ratio. It is useful to have some basic instruction before you dig in, and if you don’t have any expert friends to take with you, there are lots of resources online about how to eat crabs including countless Youtube videos. The ‘apron’ is a magic key to opening crabs and without knowing some crab picking secrets you can end up wasting a lot of meat. I find picking crabs enjoyable if you accept that it takes time and you aren’t too hungry to start with. Make sure you have some good company. Like I said - It's messy. 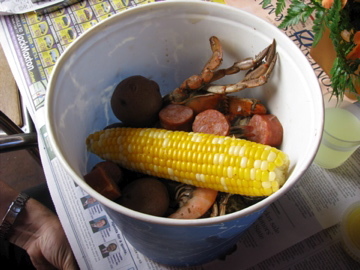 At Hills you are given a bucket with the crabs, potatoes, Andouille sausage, shrimp and an ear of corn. Growing up we used to just get bags of boiled crabs, so having the other accompaniments is new to me. I’m happy with just the crabs. 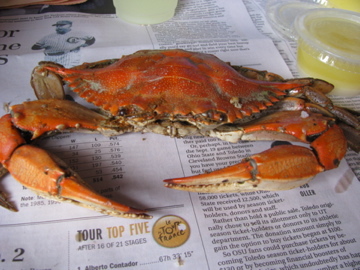 The crabs were not as highly seasoned as I am used to and you could barely detect the bay seasoning. We also had lemonade, a dish of I-don’t-think-it’s-real-butter, cocktail sauce and various condiments. The concept of the crab boil was great, the portions were generous, but I did have some complaints about how things were cooked and flavored. I am not sure whether it was planned or whether they had extra crabs left over but they kept offering us more crabs and we ended up taking 8 of them home with us along with a few potatoes. 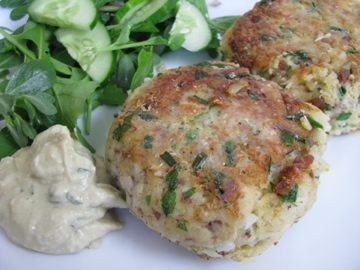 I made crab cakes the following day which AD enjoyed more than the crab boil. I included some of the left over crab boil potatoes which added moisture and were already infused with the crab flavor. A pinch each of: celery salt, cayenne pepper, dry mustard, salt & white pepper. Whizz the potatoes in the food processor until finely chopped. Add the rest of the ingredients and mix well. Use your hand to decide whether the mixture is will bind and hold together in the pan. You may need to add some more moisture, or more bread crumbs. If you want to add some more moisture you can use mayonnaise. Chilling the crab cakes in the refrigerator for an hour or so will help them hold together in the pan, but is not essential. Lightly dust them in flour and gently fry in a mixture of olive oil and butter. 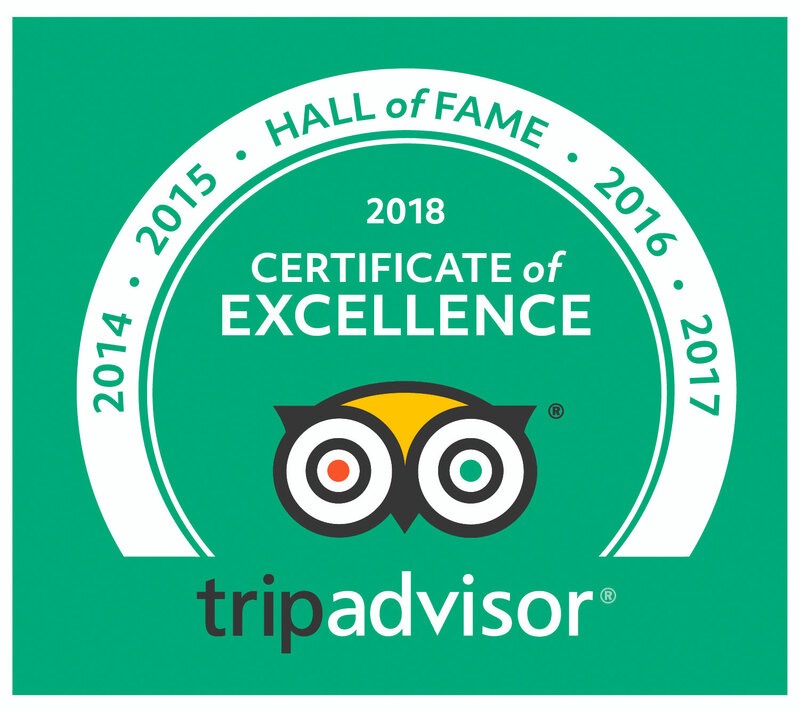 I served them with a salad of purslane, cucumber and arugula and a dollop of homemade garlicky Baba Ganoush, which worked well as an accompaniment. I wonder what country’s cuisine inspired someone to put sausage pieces into a bucket of crabs? !